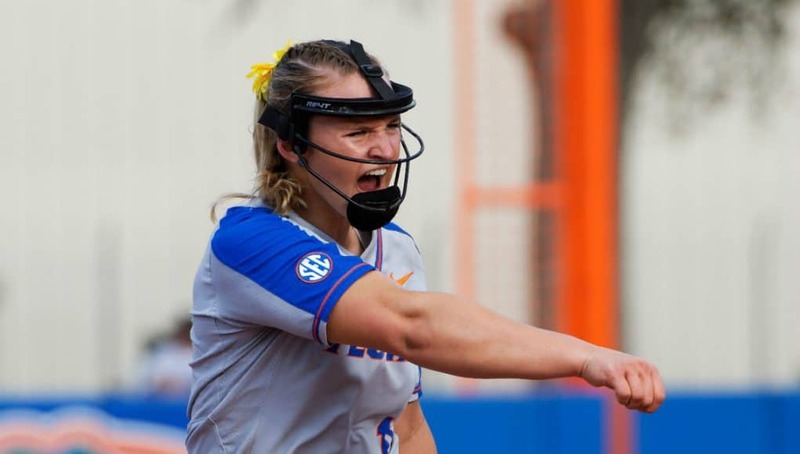 GAINESVILLE, Fla. – The fifth-ranked Florida softball team downed No. 8 Florida State 5-1 at Katie Seashole Pressly Stadium Wednesday night in the final game of the 2018 Fresh from Florida Sunshine Showdown. 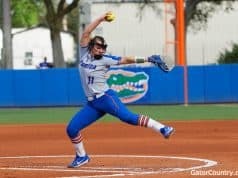 Kelly Barnhill (22-1) led the Gators (42-7) from the circle as she struck out 10 Seminoles (39-9) in the complete-game effort. Seniors Nicole DeWitt, Kayli Kvistad, Aleshia Ocasio and Janell Wheaton helped lead the charge at the plate as the group accounted for five of the eight hits on the night. After posting a trio of hits through the first five innings, the Gators offense finally broke through in the sixth against the Seminoles and took a 5-0 lead. Amanda Lorenz started the rally with a leadoff single up the middle and moved into scoring position on a wild pitch from FSU starter Meghan King (14-6). DeWitt broke the scoreless tie with her RBI double to center field that scored Lorenz from second. Kvistad followed up with a full-count walk and Ocasio loaded the bases with a bunt single down the first base line. Wheaton put Florida ahead 2-0 with an RBI single through the left side to score DeWitt. Sophomore shortstop Sophia Reynoso extended the Gators lead out 5-0 with a bases-clearing double off the outstretched glove of third baseman Jessie Warren – Ocasio, Wheaton and Matthews all scored on the play. Florida State scored in the final frame of the game on Warren’s leadoff home run to center field. Barnhill bounced back to strikeout the final three batters of the game and seal the victory. Next up for the Gators is a three-game series against No. 13 LSU. The first game of the series is slated to start at 5:30 p.m. on the SEC Network. 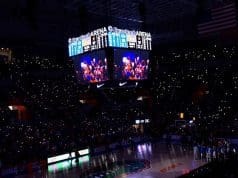 · Florida extended its all-time series lead over Florida State to 25-16 and 13-7 at home. o Florida is now 38-2 when scoring first. o The five runs scored in the sixth is now the 28th time that the team has scored four or more runs in an inning. · Kelly Barnhill struck 10 batters in the contest and struck out the side twice. o It’s Barnhill’s 13th game of the season with 10 or more strikeouts and has now struck out the side 25 times. · Amanda Lorenz posted her 15th multi-hit game of the season after going 2-for-3 at the plate. · Head Coach Tim Walton was recognized pregame for achieving his 800th career win and 700th as the head coach of Florida Gators. o Walton holds the highest winning percentage among active NCAA Division I softball coaches. § His career record stands at 831-209 for a .799 win percentage. 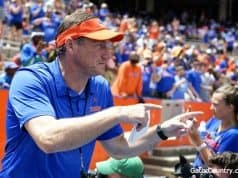 § He also has a record of 708-145 (.830) in his 13 seasons as the head coach of the Gators.